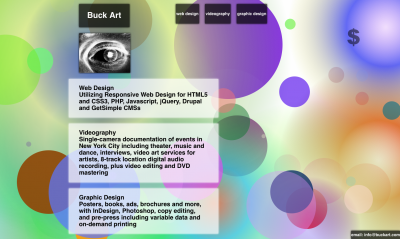 My new computer art project artMachine provides the active background of buckart.com. As you move or click the mouse, artMachine creates compositions which are then destroyed as you continue to interact with the page. This makes the compositions like the landscapes you see from a moving car. You can stop for a great vista—maybe you can even stop, build a house and enjoy it for the rest of your life—but if you just keep moving you will see millions of vistas, including thousands beautiful enough to be worth stopping for. The compositions are in the tradition of 20th C. abstract art. As a painter and photographer I’ve always been interested in 2D composition. I’ve found that relatively simple computer programs can produce compositions which are pleasing, and it only requires artistic sense to find methods which are pleasing more often than not. I personally like lots of the compositions generated by artMachine. I enjoy most of the colors, which might be too many for your taste. More sophisticated color pickers are to come. But I think you might find that even if the colors and compositions aren’t good for you, just keep playing with the interface—it may surprise you.